Will the West prevaricate once more at UNHRC ? ( March 5, 2014, Bradford UK, Sri Lanka Guardian) One swallow does not make a spring and UNHRC high commissioner Ms Navi Pillai is constrained by US-UK whose interests in tiny Sri Lanka have nothing to do with human rights. After all it was US Defense Secretary Casper Weinberger, a Republican under Reagan administration, following July pogrom of 1983 who told President J.R. Jayewardene that if the LTTE are a menace, why the hell does he not bomb out North and East. US likes Band-Aid solutions and does not consider repercussions nor does it bother about people outside its borders. What matters to the US is it is the big brother and police of the universe. And the West has priorities which transcend UNHRC. While all eyes focus on Ukraine, Sri Lanka is furthest from the West’s mind. As a graduate journalism colleague at UC Berkeley said US already has 51 states and nobody could be arsed with countries outside it and he did not know where Sri Lanka was, never mind whether there was strife between its ethnic communities. US certainly does not want Russia to come into prominence and will do all it can to keep Ukraine’s sovereignty for itself. It managed to splinter Russia and weaken it for the time being. But Vladimir Putin is all out to exert his dominance in former Russian states including Ukraine. Ergo, US congress is not spending sleepless nights trying to bring SL Government before Hague’s war crimes tribunal. President Mahinda Rajapaksa’s complacency is to a certain extent valid since the March UNHRC sessions could be postponed ad infinitum and SL emissaries would sit there with arguments and reasons why it had not complied with UNHRC recommendations. Having said that Tamil diaspora have far more clout than the government believes. Their votes count come election time. Their campaigns since the LTTE was defeated opened eyes which were dormant for quite a while. The government looks the other way when black economy from illegal asylum seekers enriches the coffers of Britain. The only saving grace Tamils have so far is former Supreme Court Judge and elected Chief Minister of Northern Provincial Council C.V.Wignesvaran. He endorsed Ananthi Sasitharan to represent Tamils at UNHRC and he made a wise decision. Ms Sasitharan minces no words and she tells it as it is. She seeks no publicity but speaks from the bottom of her heart. She is no flash in the pan Ms Radika Sathiasabesan, the much flaunted Canadian MP, who is revered by ageing journalists and politicians. Ms Sasitharan has the gumption to challenge anyone and having been a witness and a victim of war will counter head on, the lame-duck LLRC or any disinformation the government would flaunt before UNHRC decision makers. 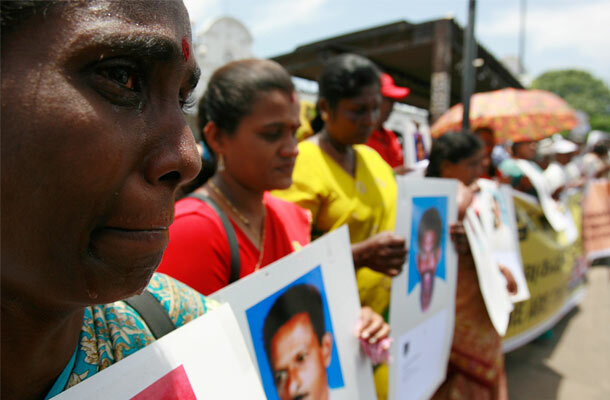 The government is jittery and seeking sycophants to support its lethargy in addressing grievances of the Tamils since war ended in May 2009. Five years is a bloody long time to address and answer questions raised at UNHRC why it had not implemented the LLRC proposals and conducted meaningful investigations into alleged war crimes. Compounding the insouciance of the government are the mass graves which beg the question that the government had direct complicity in gross mass murders carried out by government security forces which it thought would go un-noticed. That it engaged Douglas Devananda, a human trafficker, former militant and a politician made persona non-grata in the UK who is provided with VIP security, KP who has now turned into a benefactor of supporting orphanage in Wanni and other former LTTE cadres who turned tail and now supporting the government to cover their posteriors and Karuna, one time military commander of the LTTE who defected to the government not to mention Pillayan in the East. White van abductions are not conducted by the Sinhalese. They are conducted by Tamil traitors engaged by the government to pit against Tamils. Sri Lanka is becoming another Diego Garcia (Chagoss Islands in the Indian Ocean) whose inhabitants were packed off overnight to Mauritius and told they did not belong to Diego Garcia and henceforth it belonged to the US and UK endorsed it. British who love their pets incinerated the islanders’ dogs en masse. This was during the 1970’s. Diego Garcians are still demonstrating in the UK fighting to go back to their country. And if US wants to base its military presence it would not hesitate to send us adrift to no man’s island as long as it can eye Iran’s oil and India’s nuclear facilities. And UK would back it to the hilt since both nations are bound by heredity. China sheds no tears for humans since it is bent on beating India in the rat race to emerge as Asia’s economic giant. China has no moral soul and it values materialism more than compassion which Lord Buddha preached and it is bent on pooh-poohing the values of Buddhist Dharma which was once its spiritual guidance. Unfortunately the unholy alliance Sri Lanka has with China is eroding the very Buddhist principles we nurtured for centuries. So it remains with the Tamils to fight the good fight and win their lost rights come hell or high water. Tamils are known for their resilience since they had to survive oppression under the jackboot of Sinhala chauvinism which proclaims only Sinhalese have Sri Lanka and Tamils could hot-foot it to Tami Nadu. Tamils are going nowhere and they will stay put in Sri Lanka which is their homeland as much as Sinhalese claim it is theirs and theirs alone.